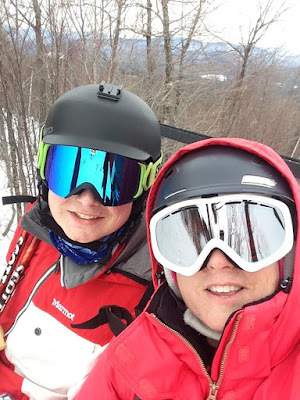 A recent article by Maine skier and writer Josh Christie reminded us that a afternoon of skiing can be a lot of fun. We tried it today with a Sunday afternoon day at Mt. Abram and yes, it was a lot of fun! trails in Maine, Fearless Leader, is open and skiing great. As we drove up to Mt. Abram late in the morning it was humorous to see all the cars with out of state plates and skis on the top make their way down Rt. 26 on their way home from Sunday River. The snow was soft and craveable and after 2pm we pretty much had the place to ourselves. It was refreshing not having to get up at the crack of dawn to ski. The price was right ($35 afternoon ticket) and we had a blast! One of our best days of the year. Rumour has it old man winter might make a return to Maine in a week or so. Maybe, just maybe. And maybe Saddleback will... ummm... nevermind. Always fun skiing with my wife and son!